Why did you give your life to Jesus: My parents are Christians, so I grew up believing in God. I became a Christian when I was 5. I did not understand everything about God obviously, but I knew that it meant that my life was given to God. Even as a kid there was nothing else to live for. I always wanted to live for God but I did not always know how. My mom died from cancer during my freshmen year of high school. She was always the person that I looked up to because she was so in love with God. I didn't always live for God, and I had major compromise in my life. My life changed when I was 18 at a worship service. I had grown up in a very traditional church and setting. I went to this spirit-filled church (or whatever you call it!) and God changed my life. It was the first time that I had ever worshipped God. I was filled with the power and presence of God that day. That is also when the fire of God came in my life and started burning things away that weren't about Him. I met a man that started teaching me about God. I knew that I wanted to live for God, but I had so many areas to grow in. After about 2 years I finally had my life turned around and was living consistently for God. I have a passion to show people that there is more to a relationship with God than going to church on Sundays. Most of the Christians that I know that are really living "in the world" are also compromised. I believe that God wants to give us power and release power in His people. This year I prayed that God would give me power in my life to see people healed and demons cast out and people to get saved from it. Jesus saw this every day, and we barely ever see it. I felt that God was saying to me, "to really see Me move in power in people's lives, you have to be in the world! But if you've not been trained in the Word and prepared to know Him radically, then you are not going to make it." This year I want to be in the world and be a radical voice for Jesus in my generation. John: Well Skillet was a side project of other bands. Did you know that? 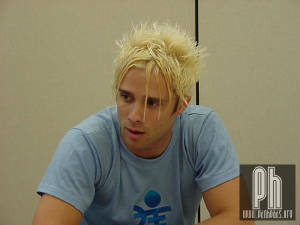 Will (Reporter from panheads.org): I didn't know that. J: A side project, and so... I historically... am incredibly in control of everything. And I'm a real perfectionist so things aren't going well it's like "Man we gotta get this right." And so.. when the idea of Skillet came up, pastor decided to get me and Ken together, I was like 'Yeah let's try it, it'll be a side project.' So I was pretty not caring in a lot of things. W: Now you were working at the church at the time, right? J: Yes... I think so. I don't remember. Some of those years there were a blur. But there was about a year there I was janitoring at the church and going to college. So it was kinda like, 'Yeah Skillet, ya know, whatever, let's do it.' I really didn't think it would be that serious, about a month after we got together we got signed. So it was pretty, it was pretty intense. The reason we call it Skillet is cause we were all from different groups. It was kinda like cooking like all these different styles of music. All kinda coming together. Will: We were equating the band to an omlette. W: What part of the omlette would you be? W: That's exactly what everyone is saying! That's what I came up with - because the eggs are like, the base of the omlette. W: We're like.. John's the only one that's been there the whole time. J: I'm the strength of the base of the pillar. J: *chuckles* Nevermind. *chuckles, stammers* Nevermind. Ya ever seen Dune? W: Yeah I've seen Dune. It's a crazy movie. Crazy movie. W: You got a fair amount of publicity with the song Rippin' Me Off as kind of like a reaction to secular and even anti-Christian music. Do you see that as being a future.. or something that you'll pursue more as.... I wanna say, combatting secular music and anti-Christian music, but also do you see, moving toward trying to grab more of a secular audience? More than... I mean, you already are quite a bit. J: Oh okay, I see what you're saying. Okay, I don't see it as a move of combatting, ya know, I don't usually write lyrics like that. It was something that was just so spontaneous. Uhhh.. but hopefully.. we're gaining more and more of a mainstream audience. I think it's very small, the mainstream audience that we have. But I'm hoping that it would grow. I mean, that's what we'd love to see happen, you know. W: Here's one. This is something I got off the Yahoo! message boards just a couple of days ago. Skillet Club, which is one of the big, major boards. Apparently, a couple of kids, y'all were in South Carolina last weekend. I was supposed to be there but I was... A group of kids, I don't know how many, were gonna go the show, but then their parents wouldn't let 'em because uh, according to this message, their parents thought that all rock music was evil. And this is something, when I first was telling my co-workers about Skillet, I was, it's a Christian rock band. A Christian ro- how's that- I mean.. How do you react to that? Or what do you say to people that can't fathom the idea of Christian rock? J: Sure. Weeeellll.. I mean.. it was pretty much Christians. *says a lot of indescipherable stuff* Okay I see what you're saying. It was pretty much non-Christians they just that like.. that doesn't make any sense. Or are you talking about mostly Christians? W: Yeah. Well, I'm guessing that most of these kid's parents were mostly Christians. J: Yeah that's what it sounds like, yeah. W: They just couldn't image that rock music that could be giving good lyrics. W: Last one, and this is one we're gonna ask all y'all. Since we're Panheads.org. What - We have- the only definition of a Panhead that we have is one that Ken Steorts gave. Uh, several years ago, what is-uhm-when he was still- How do you define a Panhead? J: Oh man. The definition of a Pa- Well.... just because someone likes Skillet doesn't make them a Panhead. Ya know what I'm sayin? It's kinda like just because you're a Christian doesn't mean you're a part of the Alien Youth. Or something like that. Lemme think here. It'd probly be people that're, it's people that are somehow over the top. Whether that means they drive a long way to see us. People that bring skillets to show. Something that kinda makes people out of the ordinary. 'Wow they really like us!' Ya know. That's kinda how it started. I think now people that are Skillet fans are Panheads. Still, our fans are typically people that don't necessarily love Skillet or people that really like us. Ya know. *chuckle* It's probably the reason we haven't sold a million records!